Top tips on how to be green and idle, save money and energy, and have sparkling dishes! This is not a masterclass. But I can tell you what has worked for us, a family of four. We have a not-very-smart mid-range slimline domestic dishwasher. This is what we do as of November 2009, updated 2017 for our new dishwasher. Run when full, usually not at the hottest setting, usually at night when grid demand and carbon intensity are low. Real-time GB grid carbon-intensity monitor (beta) and mobile version (beta) and follow on Twitter @EarthOrgUK to get a txt! Run your dishwasher only when it is full if possible. You get more for the detergent and energy that goes in. Run the coolest/quickest programme that will do the job. Heating water uses almost all of the wash energy. Choose a programme that lets your dishes dry in the air. A 'thermal dry' uses a fair bit of energy and is usually not needed. Especially if you have time and/or a dish rack for tricky items. Scrape off any excess food before loading the dishwasher (maybe for your compost bin). Now the detergent is washing the dishes not your discarded food! Rinsing dishes under a tap is probably unnecessary and wasteful of water. The wash programme on our ancient (Zanussi DW-24 slimline) dishwasher that I normally used ('heavy soil') starts with a prewash (essentially a cold rinse with some detergent). That is followed by a full hot wash, hot rinse and thermal dry. Run the cold rinse programme with a little detergent (or soda crystals or non-foaming washing-up liquid to be effective cold). Prevent food caking on, especially dairy products, if a full wash is not going to be run for a while. Clean the filters (if bunged up) before the main wash. This makes sure that the water pumping, etc, is as effective as possible, not merely spreading old food around the machine! Your dishes will be cleaner for it. A cold rinse can get a lot of dirt off the dishes and uses virtually no energy. I can't even measure the consumption on my plug-in meter. So it's way less than making a cup of tea, and no more than a few percent of the full wash. If you are in an area short of water then you may skip this step. In rainy London I sometimes go wild and do a rinse in the morning to get the milk/porridge/etc off the breakfast dishes. Then again in the evening and empty the filter before the main wash! Run the main wash on a delay/timer at 2am or as near as you can get. Just before you go to bed is good. Avoid right after the evening meal! Turn off the dishwasher at the wall when done. Avoid any 'vampire' losses from the dishwasher or timer. When electricity demand is highest the transmission system is under strain. And there may well be dirtier or higher-carbon fuels generating the electricity to run your dishwasher. In the UK one peak is typically early evening. Conversely, if you can run the dishwasher in the wee hours, maybe 1am to 4am, much less CO2 is likely to belched out to run your wash, in future maybe even zero when wind (etc) is meeting demand. Clean the filters. In our case that means rinsing and brushing them under a running tap. Run a 'maintenance' wash with the machine empty or at least not jammed full. Use a hotter wash and more detergent than usual to shift any grease and gunge that has been accumulating, and that might even bung up your drains or damage the machine. If showing signs of difficulty pumping/draining, bring forward and repeat the maintenance wash to try to clear the problem. Buy the most energy-efficient model that you can. It will probably pay itself back in saved energy. Don't buy a bigger model than you need. The complex phosphates in conventional/cheap dishwasher detergents do a good job of cleaning. But they come from a diminishing resource. They are also difficult to remove at wastewater treatment plants. They cause algal growth and oxygen depletion in rivers and lakes, to the extent that some places have banned their use. 'Green' or 'eco-friendly' dishwasher detergents may be labelled as such for a number of reasons. They may work well at lower temperatures saving energy, and for being 'zero-phosphate'. We do now use such low-temperature phosphate-free tablets in most washes. But they do not do quite as good a job, typically leaving a very slight residue that most obviously builds up on glassware over time. To fix that, during the typically-once-per-week hotter maintenance wash I use a phosphate-based tablet. For the other washes the prewash detergent is still phosphate-based. (I can't find a 'green' powder anyway.) In any case, I add only a little of it along with the main-wash tablet. So we are now still using some phosphates in the dishwashing. But probably a lot less than before. 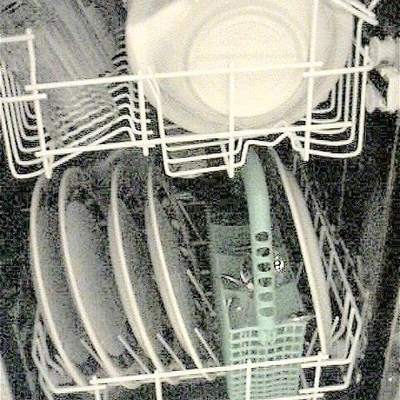 2015/03/10: 7 common dishwasher-loading mistakes that may surprise you. Consumer Guide to Home Energy Savings: Condensed Online Version: US-oriented but still very much the same story. From the US (temperatures in F): 6 Ways to Make your Dishwasher Energy Efficient. Energy-saving tips from "Time to Change". The Which? guide to a greener dishwash. 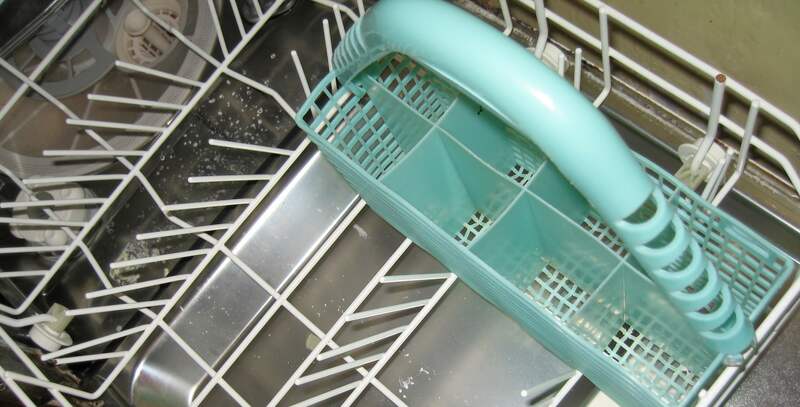 The Guardian 2005 answers Is it OK ... to use a dishwasher? with a "yes" citing Rainer Stamminger, professor of household and appliance technology at the University of Bonn in 2004. For 12 place settings the average human washer used 103l and 2.5kWh, though the best were pretty close to (or beating) the dishwasher at 15l and 1kWh using the following techniques: "scraping, not rinsing, food scraps from dishes; not pre-rinsing all the dishes under a running tap; using two sinks, one filled with hot water and detergent, the other with cold for rinsing; and not over or under using detergent." My money would still be on the machine being more consistent and removing more detergent residues! First published 2009-11-16 , updated 2019-04-23 . Site copyright © 2007-2019 Damon Hart-Davis. Hosted by ExNet.